University Master is a free online university. We offer all of our courses and materials to our students for free. We are 100% advertiser supported. We will never charge students a penny for our services. Students in America face every-increasing higher education costs. Year-after-year tuition costs rise. Course fees rise. The costs of textbooks rise. 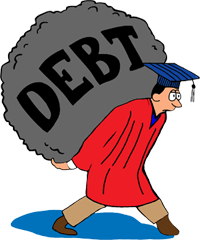 To cope with rising costs, students take out loans and are saddled with debt for 10 years or more after they graduate. University Master offers students an alternative. If you haven't started college yet, or you are still in your first year, you can gain 30 credit hours or more through CLEP testing. It's really simple. You take one of our free courses, take a CLEP test, and then you receive 3-6 credit hours per course. How many credit hours you receive depends on the course you take and the college you transfer to. More than 2,900 universities in America accept CLEP exams for college credit. Wouldn't it be great to knock out 10 or more college classes through testing, quickly and cheaply? University Master offers a complete plan for new college students. Find out how it works. We will show you the path. The rest is up to you. University Master. Helping college students graduate as quickly and cheaply as possible. © 2009 - 2019 University Master. All rights reserved. In association with Way Universe. CLEP®, College Board®, and College-Level Examination Program® are registered trademarks of the College Board, which are not affiliated with and do not endorse University Master.